Neuroscience and money are being bandied about from Wall Street to Main Street, with people realizing that what goes on in their brain directly impacts their bank account. 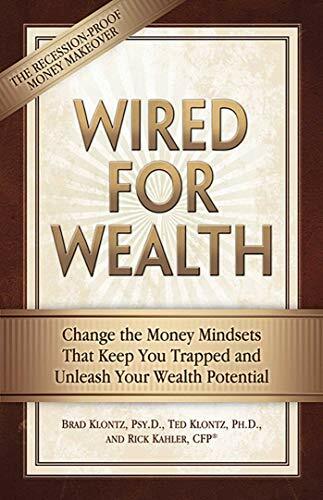 As financial stress mounts and an economic crash looms, the Wired for Wealth authors show that the biggest threat to your financial health is not a recession, it's your mindset. Markets fluctuate but one fact holds true: People's money scripts—the unconscious core beliefs they hold about money—will determine whether they win or lose. With Wired for Wealth, three respected experts explain their proven Money Makeover Program that has helped clients break through excessive debt, financial stress, self-sabotage, money avoidance, and more. Brad Klontz, Psy.D., is the 2008 President of the Hawaii Psychological Association. He is a licensed clinical psychologist, speaker, researcher, consultant, columnist, and personal coach. The CEO of Klontz Coaching & Consulting (www.klontzcoaching.com), Brad has been published in numerous professional journals. He is a leading expert in the psychology of money whose work has been featured on NPR and in the Wall Street Journal and Washington Post. He is the coauthor of Facilitating Financial Health and the creator of the Financial Health Scale. Ted Klontz, Ph.D., is the President of Klontz Coaching & Consulting (www.klontzcoaching.com) and a noted pioneer in bending the fields of psychotherapy and financial planning. He is a speaker, workshop leader, and has an active private coaching/consulting practice. Ted has been a contributor and coauthor of a number of books, including Chicken Soup for the Recovering Soul and Facilitating Financial Health. His work has been featured in Wynonna Judd's best-selling book Coming Home To Myself, and he has been a guest on Today and Naomi's New Morning on the Hallmark Channel. Rick Kahler, CFP®, MS, ChFC, CCIM, launched his professional career in real estate at age eighteen and went on to earn a master's degree in personal financial planning. He founded Kahler Financial Group in 1981 and became South Dakota's first fee-only financial planner in 1983. Between 1998 and 2003, he served as a member and then chairman of the South Dakota Investment Council. He oversaw a six-billion-dollar portfolio and was widely recognized for making exemplary strides in a time of unprecedented market volatility. Whatever your circumstances, you probably grew up in a neighborhood where the majority of the inhabitants were in many ways a lot like you. Just imagine one such neighborhood: a stereotypical suburb. Everyone who lives there pretty much knows everyone else―not necessarily intimately, but by reputation, occupation, and observation. The houses were built at about the same time, and most of them tend to be a similar style and in the same general price range. There are a few places that stand out, however. There's Jodine's house at the end of the block―the one with the Mercedes and the Cadillac SUV parked in the driveway. Jodine and her husband have built an addition and put in a swimming pool. Then there is Alecia's house, down the street, the one that hasn't been painted in a number of years, where the lawn has a generous sprinkling of dandelions and the car in the driveway is a ten-year-old minivan with a crumpled front fender.